This is version 0.10.9 of EEFlux. Automated calibration of ETrF is still evolving. The last update was Mar. 26, 2019. See the FAQ regarding the version numbers. EEFlux (Earth Engine Evapotranspiration Flux) is a version of METRIC (Mapping Evapotranspiration at high Resolution with Internalized Calibration) that operates on the Google Earth Engine system. EEFlux has been developed by the consortium of University of Nebraska-Lincoln, Desert Research Institute and University of Idaho with funding support by Google. EEFlux processes individual Landsat scenes from any period from 1984 through present and for nearly every land area on the Globe. EEFlux uses NLDAS gridded weather data in the US and CFSV2 gridded weather data globally to calibrate the surface energy balance for the image. Actual ET is calculated as a residual of the surface energy balance as ET = Rn - G - H where Rn is net radiation, G is soil heat flux and H is sensible heat flux. EEFlux utilizes the thermal band of Landsat to drive the surface energy balance and short wave bands to estimate vegetation amounts, albedo, and surface roughness. Level 1 of EEFlux employs automated calibration of the image. ET is expressed in terms of ETrF which represents ET as a fraction of reference ETr. In EEFlux, ETr is calculated using the "tall" alfalfa reference as defined with the ASCE Standardized Penman-Monteith equation. ETrF is similar to the traditionally used 'crop coefficient'. ETrF = ETact / ETr. To apply EEFlux, the user can specify start and stop dates to search in the date window and then move the orange pin on the Google map into the area of interest. When the 'search image' button is pressed, EEFlux will search the Google archive for those Landsat images that reside within the date range and that cover the area identified by the pin. For areas that are covered by two paths, images from both paths will be presented. EEFlux will then provide a list of images for the location and permit the user to select one image to process. EEFlux processes one image (scene) at a time (this will change in the future). The list of images available includes an assessment of percent cloud cover for the entire scene as determined by the USGS EROS data center. Once an image has been selected, EEFlux will present a list of data layers that can be displayed in the map window. The ETrF and ET-actual images can be downloaded as geo-tiff files using the hot links on the EEFlux site. A reference for general equations for EEFlux, based on those of METRIC is available at: http://www.intechopen.com/books/evapotranspiration-remote-sensing-and-modeling/operational-remote-sensing-of-et-and-challenges which is an Intech book chapter compiled by Dr. Ayse Kilic (Irmak) of the Univ. Nebraska-Lincoln and associates at the University of Idaho and Desert Research Institute in 2012. An original reference for METRIC is Allen et al., 2007 published in the ASCE J. Irrigation and Drainage Engineering. Base Map – Google Earth map showing roads, cities and significant features. True Color – This is a color composite of the red, green and blue bands of the Landsat image. False Color (4, 3, 2) – This is a color composite of Landsat 5 and 7 bands 4, 3 and 2. For Landsat 8, it is bands 5, 4, 3. False Color (7, 5, 3) – This is a color composite of Landsat 5 and 7 bands 7, 5 and 3. For Landsat 8, it is bands 7, 6, 4. Albedo – This represents total, integrated reflectance across the electromagnetic spectrum. It is calculated from the six primary short-wave bands and is useful for energy balance work. Based on Tasumi et al., 2008, ASCE J. Hydrologic Engineering. NDVI – Normalized Difference Vegetation Index, calculated from the Near Infrared (NIR) band and red band using at-surface reflectance. DEM – Digital Elevation Model in meters. We use the 30m SRTM. Land Cover – For CONUS, we use the National Land Cover Dataset (NLCD) at 30 m. For outside CONUS, we use the European Space Agency (ESA) GlobCover land use map at approximately 300 m resolution. In both cases, the definitions and color scheme of NLCD are used for consistency. We use the NLCD version (2001, 2006, 2011, 2016) that resides closest to the Landsat image date. Alfalfa Reference ET (ETr) – This is the standardized ASCE reference ET for the daily tall alfalfa Penman-Monteith reference equation (ASCE 2005) and represents a near maximum ET rate. ETr tends to be 20 to 40% stronger than grass reference ETo. For CONUS (except California), the daily ETr is derived from GRIDMET gridded weather data. In California spatial CIMIS data are used. For outside CONUS, ETr is derived from CFSV2 gridded weather data. A 10 to 20% high bias in ETr can occur due to inherit high bias in air temperature and low bias in vapor pressure in the gridded data sets as compared to that within a well-watered agricultural environment. Therefore, downward adjustment in the actual ET estimates (map) may be warranted. 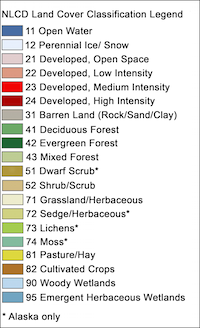 Grass Reference ET (ETo) – This is the standardized ASCE reference ET for the daily clipped, cool season grass Penman-Monteith reference equation (ASCE 2005, FAO56 1998) and represents an average maximum ET rate for clipped grass. ETo tends to be 20 to 40% lower than alfalfa reference ETr. Therefore, maximum EToF can be expected to run as high as 1.3 or 1.4 for well watered vegetation. For CONUS, the daily ETo is derived from GRIDMET gridded weather data. For outside CONUS, ETo is derived from CFSV2 gridded weather data. A 10 to 20% high bias in ETo can occur due to inherit high bias in air temperature and low bias in vapor pressure in the gridded data sets as compared to that within a well-watered agricultural environment. Therefore, downward adjustment in the actual ET estimates (map) may be warranted. ETrF – std. calib. – ETrF is the “fraction of alfalfa reference ET” and is similar to the alfalfa reference-based crop coefficient. ETrF generally should vary from 0 to 1.0 or 1.1. ETrF is developed by EEFlux during the energy balance process. The standard calibration (std. calib.) uses the built in automated calibration of EEFlux (which will be revised and improved over time). EToF – std. calib. – EToF is the “fraction of grass reference ET” and is similar to the grass reference-based crop coefficient (of FAO56, etc.). EToF generally should vary from 0 to 1.4. EToF is developed in EEFlux following the energy balance process by multiplying ETrF by the ratio of ETr/ETo for the 24-hour period of the image. The standard calibration (std. calib.) uses the built in automated calibration of EEFlux (which will be revised and improved over time). Actual ET, mm/day std. calib. – This is the 24-hour actual ET from each pixel that is associated with the date of the image, and that is associated with the standard automated calibration within EEFlux. To obtain ETactual for other days, one can multiply ETrF by ETr for other days or multiply EToF by ETo for other days. ETrF can be interpolated between adjacent images in time. Adjusted ETrF – This is ETrF following any adjustment by the user using the adjustment tool at the bottom of the EEFlux screen. This image can be downloaded in addition to the ETrF – std. calib. image. Adjusted EToF – This is EToF following any adjustment of the ETrF image by the user using the adjustment tool at the bottom of the EEFlux screen. This image can be downloaded in addition to the EToF – std. calib. image. Adjusted Actual ET – This is actual ET for the date of the image following any adjustment of ETrF by the user using the adjustment tool at the bottom of the EEFlux screen. Why did the version number go backwards? Answer: The version numbers we were using before were applied inconsistently. We now follow a pattern called semantic versioning. The version displayed on the site is the version of the code being used to produce the images, so the version number will not change when changes occur to the website layout or website functionality. Only changes to the image processing code will result in verison number changes. Versions deployed to the site will not always be consecutive. Why aren't my downloads working? Answer: There are two common situations. If the download doesn't even start, your pop-up blocker may be blocking the download. Simply turn it off and try again. If you get a downloaded image but it won't open, or is corrupted, then your internet connection was likely inturrupted during the download. We are researching more stable methods for providing downloads. Can more than one Landsat scene and date be processed at the same time? Answer: No, not at this time. Each date and scene are processed independently. They can be downloaded and stitched together in image processing or ArcMap applications. Future EEFlux will have means to select multiple scene areas or multiple dates and process them as a group. Can an ETrF image be 'tuned' to modify the relative wetness or dryness level for the low ET areas or for the high ET areas? Answer: EEFlux allows the user to manually modify the minimum and maximum ETrF between which the ETrF is stretched. Answer: EEFlux is calibrated by assigning values for ETrF for the 'hot' and 'cold' parts of the surface temperature spectrum of the scene. We currently use an automated calibration scheme that works well for most agricultural areas. Users should be wary of results for times or regions where reasonable endpoints for calibration are rare (e.g. winter in North America, the Amazon rainforest). We do our best to avoid picking cloud contaminated pixels as calibration endpoints but automatic cloud masking is sometimes imperfect and can affect results. What do I do with an ETrF image once I download it? Answer: You can use the ETrF image as is to show areas of high and low relative ET. These can be useful to assessing areas of water stress, areas of irrigation, and spatial distribution of ET. The ETrF image can be 'colorized' using image processing systems such as ERDAS or ArcMap. The ETrF images can be used to develop crop coefficient curves and to derive estimates of soil moisture. If total (integrated) ET over a time period, such as one month or one growing period or one year is desired, then one will need to process multiple images and then conduct a time-integration using a spline or similar model as described in Allen et al., (2007) (ASCE J. Irrig. Drain. Engrg.) and Kilic in Intech. This is done by using the spline function to interpolate between the instantaneous ETrF images over the time period of interest, producing an ETrF estimate for every day during that period from the spline, and multiplying that ETrF value by the reference ET (tall reference) for every day during that period. The daily ET values are then summed over the period of interest, for example, over one month. Prior to the splining, mitigation for clouds may be required (see FAQ 5). What do I do with clouded areas of an image? Answer: Generally, all clouds and cloud shadows in an image need to be identified and 'masked out.' EEFlux is unable to determine ETrF for clouds and cloud shadows, as well as for jet contrails. The 'holes' left by the masked areas should be 'filled in' prior to the splining process described in FAQ 4. This can be done by interpolating between 'adjoining' image dates that have valid ETrF values for the pixel of interest. During the interpolation, some adjustment for background evaporation caused by rainfall events may be needed to produce a more 'seamless' patching of ETrF data, as described in Kjaersgaard et al., 2011 (Hydrological Processes). If adjustment for background evaporation is not needed, then the spline or linear interpolation can be run, where it is forced to pass through the cloud and cloud shadow 'holes' and to the next available image. What if EEFlux does not successfully produce ETrF (it 'times out' and gives a 'something went wrong on the server. Please try again.' Message)? Answer: This may be a bug. If after several attempts you still recieve this message email us at the address listed at the top of the FAQ. Please drag the marker on the map to select the Landsat location of interest. ACTUAL ET - std. calib. You can adjust the ETrF values by specifying the decimal fraction of ETrF to change at both the ‘low end’ and ‘high end’ of ETrF. For example, ‘-0.05’ at the low end and ‘0.15’ at the high end.